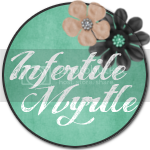 The Infertility Overachievers: We have a climber!! 18 Months, 10 days, 11 hours, and 15 minutes. That is exactly how long we made it before our little world was flipped upside down. OK, so not really "upside down", maybe I am being a little dramatic, but London has learned to climb out of his crib. My sweet little boy who goes to bed so easily and sleeps for 13 hours a night is gone. It used to be that all I had to do was take him upstairs and put him in his crib and he went right to sleep after playing for about 10 minutes. Now this. I was in a complete panic today when I heard a loud thump coming from London's room upstairs. It scared me to death because I didn't hear any screams that followed the thump. All I could picture was an unconscious little man as I ran up the stairs. Luckily just as I got to the top, I heard him quietly crying. The fall didn't even seem to faze him, he was still just whimpering because he wasn't ready for nap time. I quickly called my 4 go-to gals when it comes to mommy advice... Biz, Erin, Juanita, and Sierra. Each and everyone of them had the same response, "You're screwed!" I am still trying to figure out what to do with him. As of right now, I have completely emptied out his room. All that is left in there is his newly converted (from his crib) toddler bed. I took out his dresser and changing table as well as anything that he could reach on the walls. I tossed in a few toys and VOILA! It's a huge bedroom sized crib. Well that is at least what I am hoping for. I tried it for nap time today after taking off the front of his crib (but before I put up the toddler bed attachment). 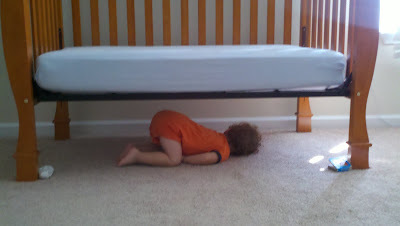 He fussed for a few mins but eventually fell asleep under his bed like this. Tonight for bed time, I put up the toddler rail and hoped and prayed for an easy bed time. I even let him stay up an extra hour. I was super lucky because he actually complied. When I put him to bed he cried for about 10 minutes and even knocked on his own door a few times. I was about in tears. Thankfully he fell asleep and when I went to check on him, I found him actually sleeping in his bed!! I'm really hoping this wasn't a fluke but rather just further proof he is his father's son and loves sleep more than any of us will ever be able to understand. Awww, I know it's scary, but you have to admit, it's insanely cute that he is passed out under his bed. LOL. You described it exactly right! It really is a room sized crib. It is a transition, but you will get used to it! Haha, that pictures is AWESOME!! One for the baby book for certain. That is the biggest bed I have ever seen!! I was lucky and caught Grace in the act of climbing out! She decided to try it out while she was just playing in her crib. But lucky us threw away (I am guessing????) the hardware to convert the crib to a toddler bed so after about a week of her rolling out of bed, waking up, crying, and then trying to get her back to sleep we put up bunkbeds (don't worry - the ladder is put up!) Now she has a rail to keep her IN bed but she can still climb out but is close to the floor. That pic is so cute! Ahhh, the new territory of a toddler bed instead of a crib. Our LO hasn't tried to climb out of his crib yet, although I'm mentally preparing myself for it to be very soon. Then we might be in trouble. that is just too funny. He looks so cute snuggled underneath his bed. Oh my goodness, that is the cutest picture! How funny that he fell asleep under the bed!! OH my gosh, that is so funny,that picture of him under the bed! We have been working on getting Henry to go to sleep in his bed rather than our arms. Last night was the first night of success. All I need for him to learn now is how to climb out! Good lord. 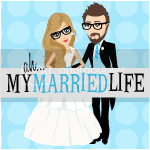 muahahaha my husband and I LOLed over that picture!